There is an aerial lift and you can command a view of Beppu Bay from the summit. You can enjoy seasonal blessings, including Rhododendron kiusianum in spring, cool weather in summer, colored leaves in autumn and rime ice in winter. 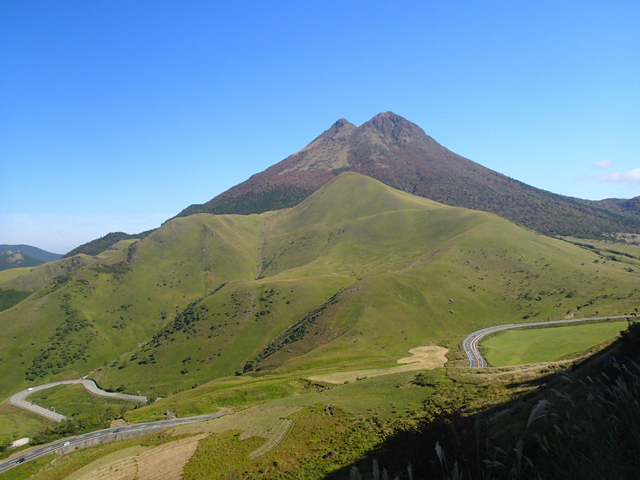 Standing behind Yufuin, the mountain is called "Bungo Fuji (Mount Fuji of Oita)" because of the graceful shape. 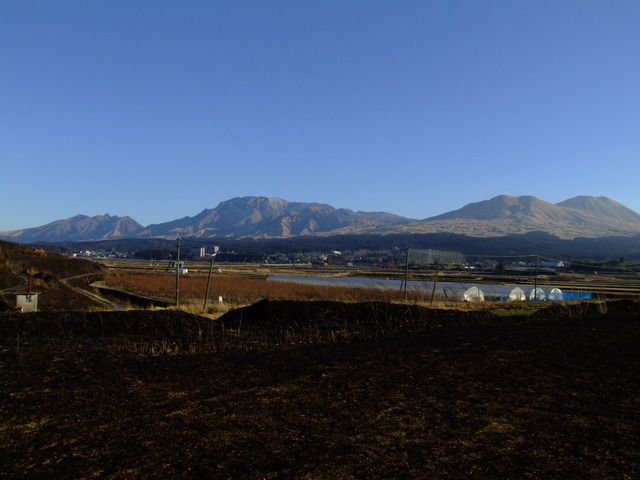 Over its base, there spreads the scenery of grassland maintained by controlled burning. In autumn, you shouldn't miss the colored leaves on the hillside. 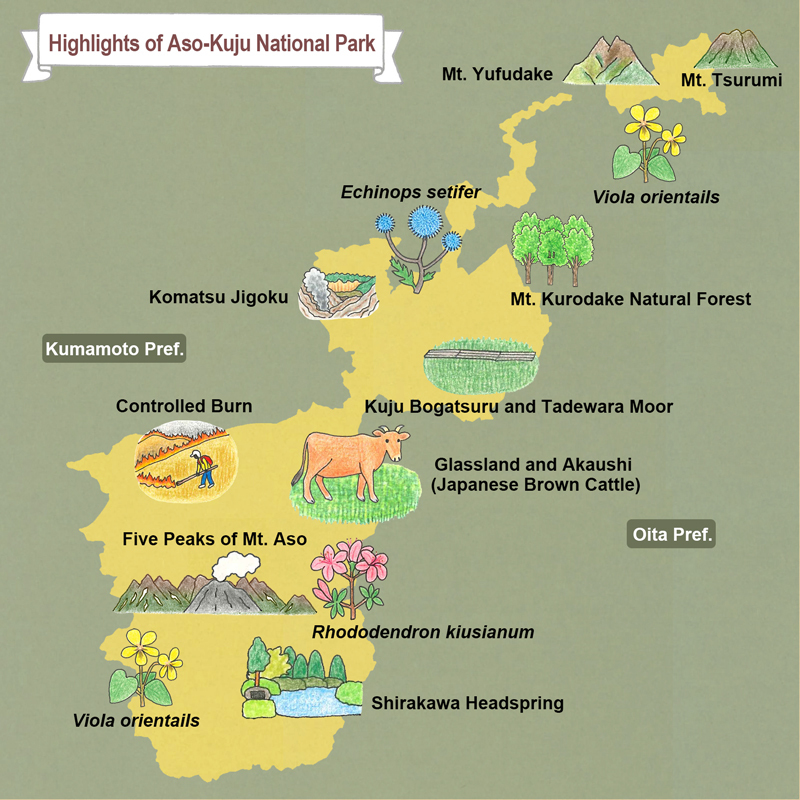 The Yamanami Highway that connects the Aso and Kuju areas, and the Milk Road that runs across Kita-Gairin caldera in the Aso-region are representative roads of Aso Kuju National Park and both offer views of vast grasslands and the Kuju Mountain Range and the five peaks of Mt. Aso that stretch out in the distance. Intermediate moors formed from the springs at the foot of Mt. 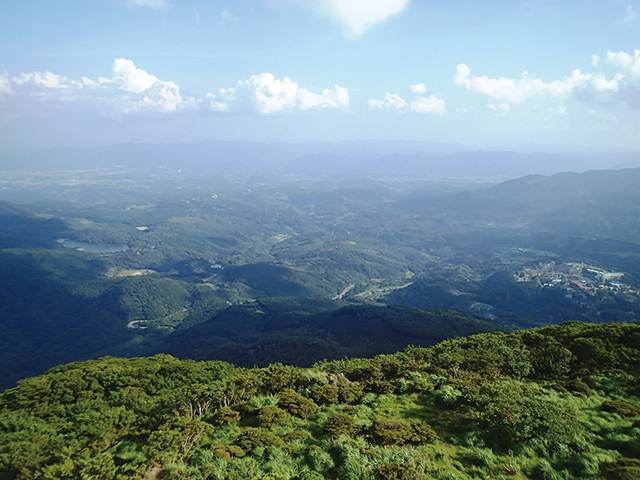 Kujusan reflect the diverse topology and geology, with a wide range of plant and animal life. 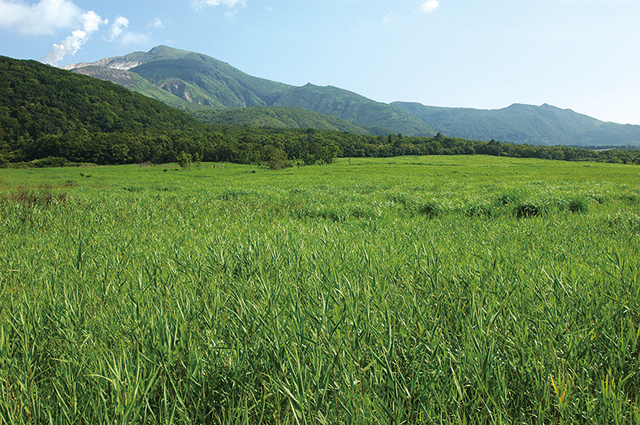 The intermediate moors formed in the mountains cover the greatest area in Japan, and are registered in the Ramsar Site. 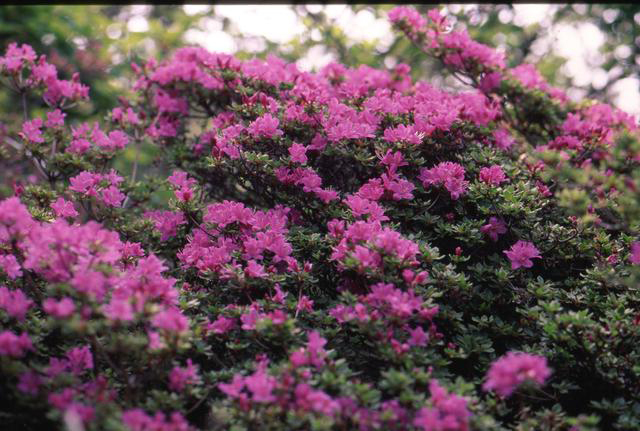 This mountain is popular among trekkers with the summit having a huge community of Rhododendron kiusianum. 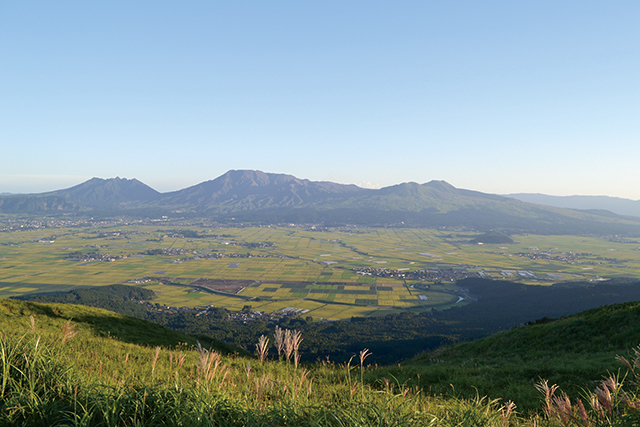 You can command a view of Bogatsuru Moor, which is a registered wetland under the Ramsar Convention. The natural fumarole zone shows you unique scenery where hot water, water vapor, and mud spout out. There is a walking trail, letting you enjoy the scenery while feeling the energy of the volcano close by. Mt. 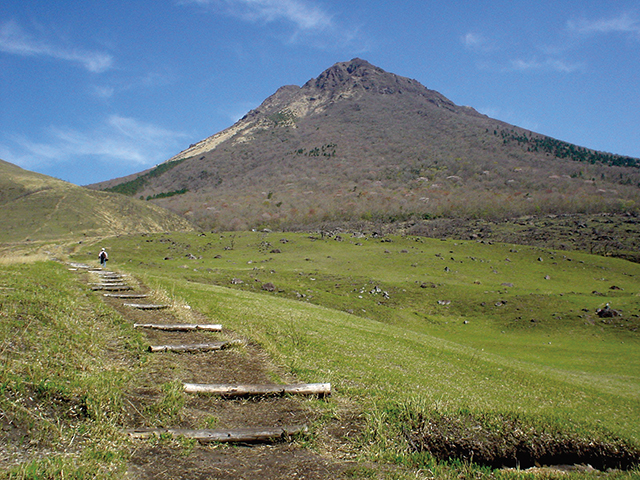 Kurodake is covered with natural forest up to the summit, with many Japanese beech and Japanese elm. 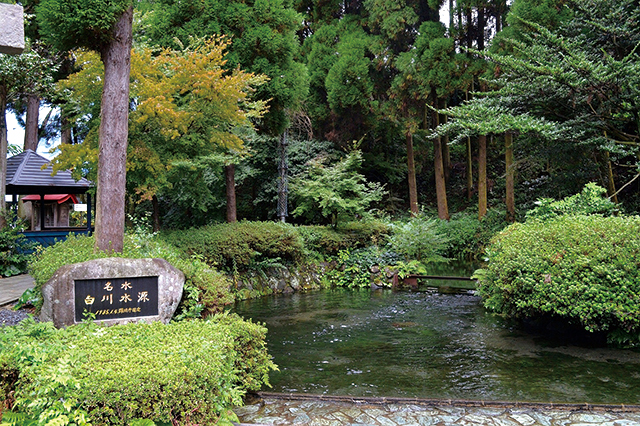 Oike Pond, Shiramizu Spring and Kakushimizu located at the trail entrance are known as some of the best waters. The wide and gentle plateau was formed by pyroclastic sediment. Pasturing is conducted in the idyllic scenery, and controlled burning is done in spring. The beautiful valley is located in the northwest of the somma and has various big and small streams and waterfalls. The water temperature is low even in summer, and the cool environment attracts a lot of visitors. This peak is a good lookout site that allows you to see the five peaks of Mt. 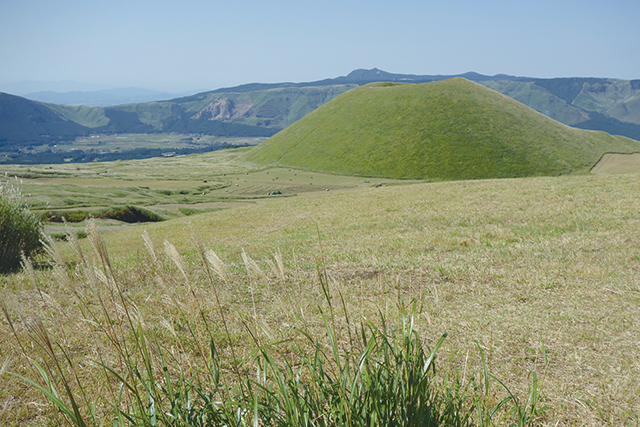 Aso called "Reclining Buddha of Aso," and commands a view of surrounding vast grassland and also north side of the Aso caldera below your eyes. There is a parking lot from where you can walk to the lookout spot in about 10 minutes. Refers to Mt. Takadake, Mt. Nakadake, Mt. Nekodake, Mt. Kijima, and Mt. Eboshi. The five peaks resemble the Buddha asleep face-up, and therefore, collectively referred to as "Reclining Buddha." Mt. 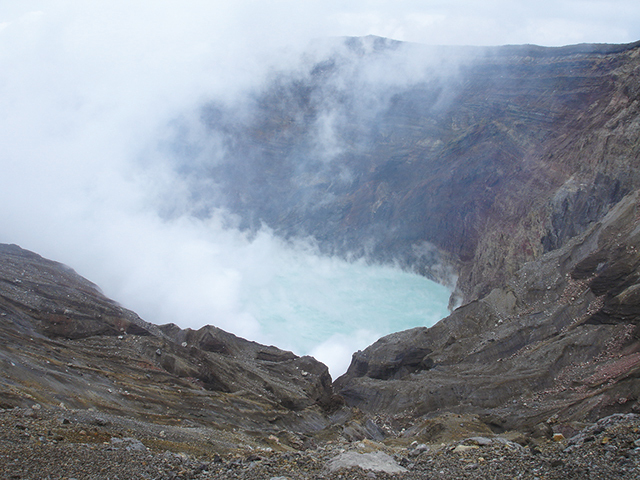 Nakadake is an active volcano. This is a double crater in which the crater of about 400 m was produced inside a crater of about 1 km in diameter. There are two ponds and grasslands, which allow you to spend time in a relaxed way in the idyllic scenery. 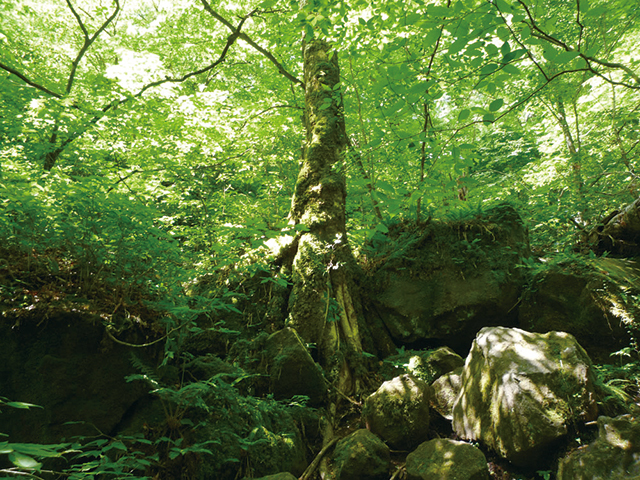 This is one of the water sources of the Shirakawa River, a first-class river in Kumamoto City. 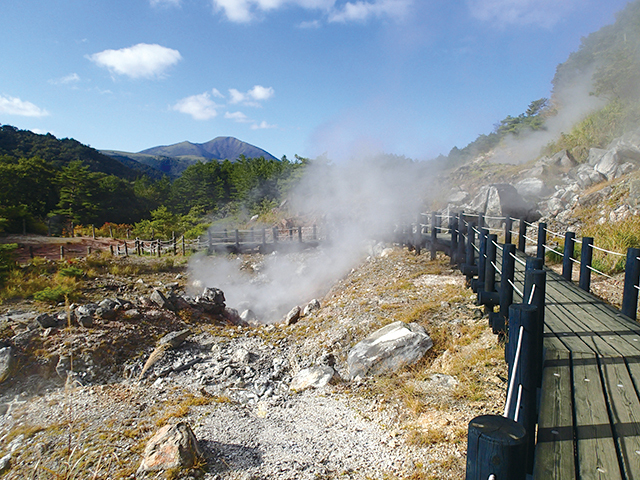 Representing the cluster of springs in Minamiaso district, this headspring generates 60 tons of water a minute. 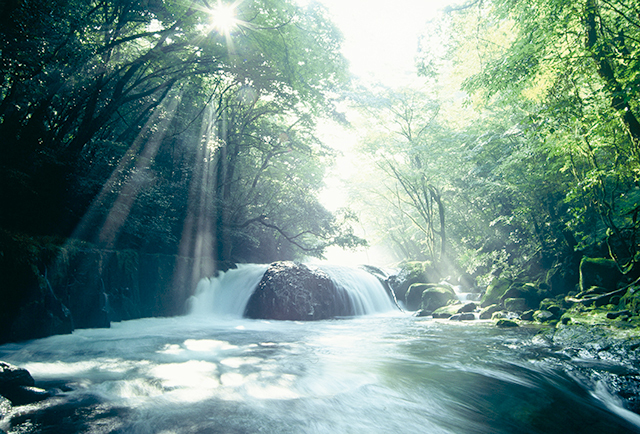 It was designated as one of the best hundred waters of Japan selected by Ministry of the Environment. 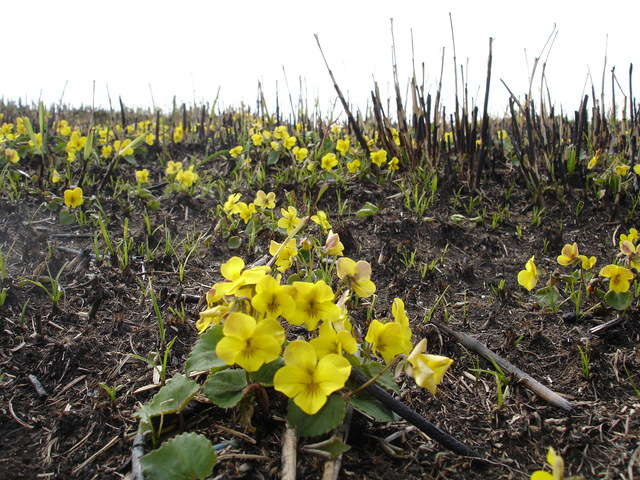 A yellow carpet is laid on the blackened remains after the grasslands have been burnt off. 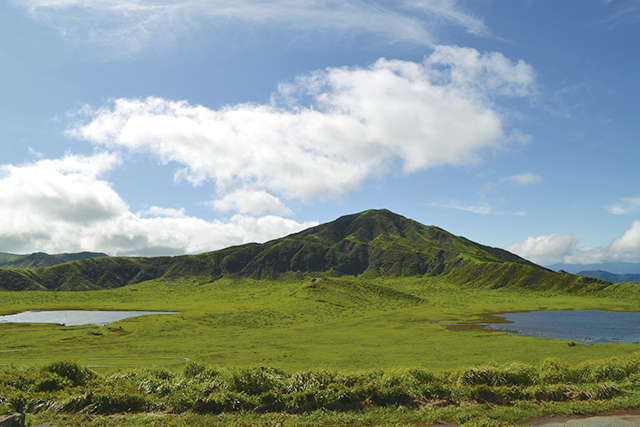 Blooming in April and May throughout the grasslands of the Aso region. A member of the Azalea family. Found on bare volcanic mountainsides in Kyushu. 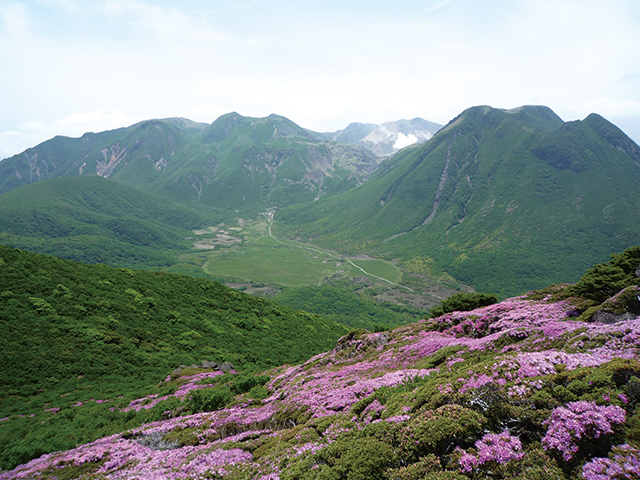 The mountains are covered in pink when the flowers bloom in May and June. In the Kuju Mountain Range, this species is being overwhelmed by other species, and are dying out. Protective measures are underway. A rare plant that still remains. Spread from the continent in the Ice Age. 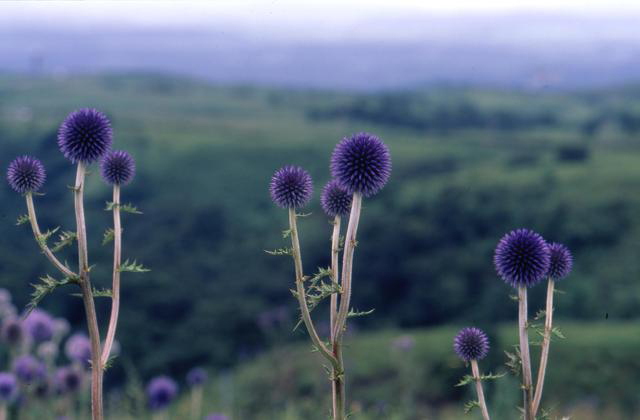 The spherical flowers bloom in azure blue in August and September. Leaves resemble those of the thistle, and have prickles. Found on grasslands. Susceptible to extinction as grasslands disappear. 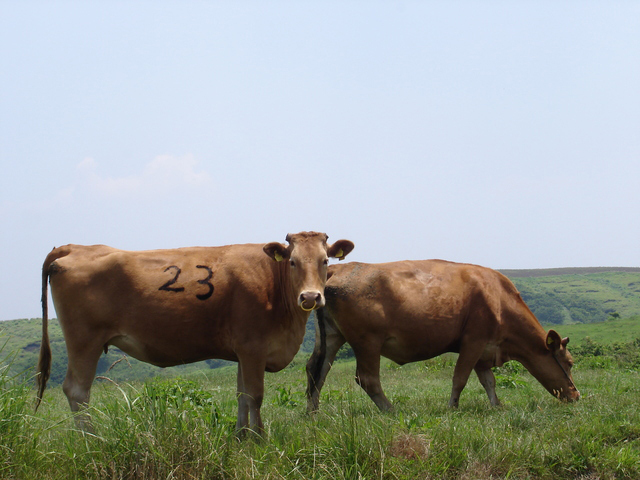 A brown cow representative of Aso. Used in agricultural work, and raised by farming households in Aso for hundreds of years. Popular as beef today. 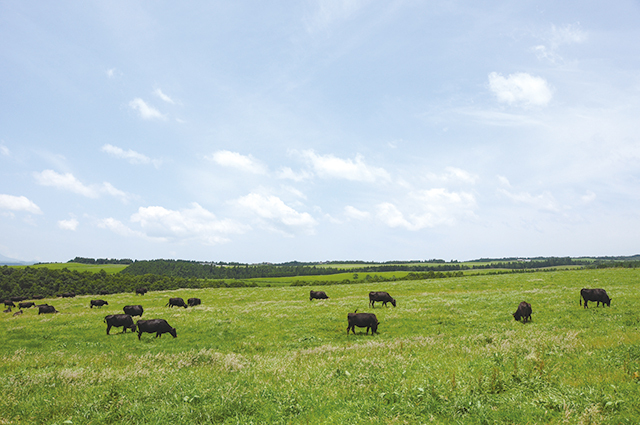 Japanese Brown Cattle are put out to pasture, providing an idyllic scene as they eat their way through the grasslands.